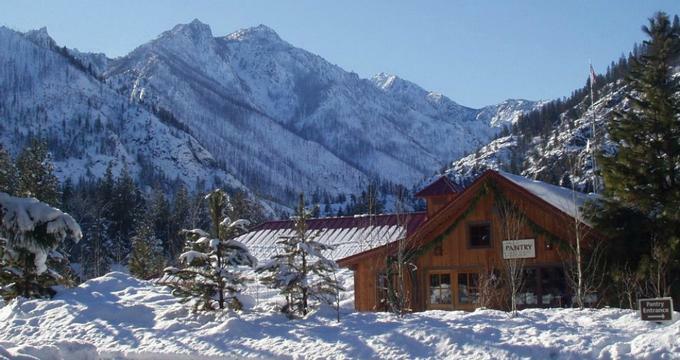 Resting on the banks on the banks of Icicle Creek in the Cascade Mountains, WA, Sleeping Lady Mountain Resort in Leavenworth> offers an exclusive Northwest wilderness experience complemented by luxury accommodations, modern amenities, gourmet cuisine and warm hospitality. 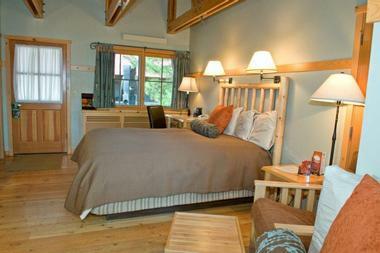 The Sleeping Lady Mountain Hotel features cozy mountain-style accommodations in arranged in six unique clusters of 6-10 private rooms. These six groups, namely Cottonwood, Rock, Pond, Meadow, Fountain, and Forest feature beautifully-appointed guestrooms with warm and welcoming décor, private bathrooms with soaking tubs and showers and breathtaking mountain views. There are also two stand-alone cabins, the Rookery and Eyrie, that provide a more private and secluded setting for honeymooners and other special occasions. Alcove rooms can accommodate up to three people and feature one queen-sized bed and one twin-sized bed tucked neatly away in an alcove in the chamber, while Double Alcove rooms have one queen-sized bed and two twin-sized beds are ideally suited to families with children. 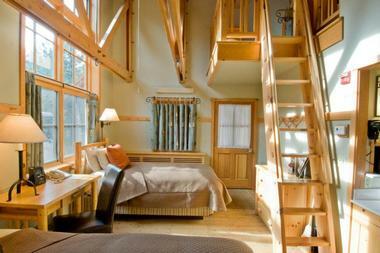 Loft rooms are located on the main floor and feature one queen-sized bed and one twin-sized bed in a ladder-accessible overhead loft. 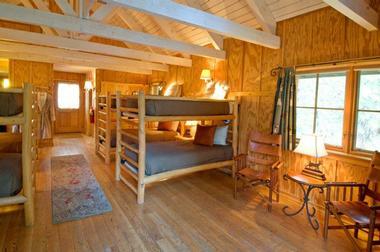 These rooms can accommodate up to five people and are ideally suited for two couples or families with teenage children. Set on Woodpecker Hill, the Rookery is one of two stand-alone cabins that has a family-friendly bunkroom with bunk beds, two bathrooms with walk-in showers, and a spacious living area that opens onto a private deck with beautiful views. The Eyrie is the other stand-alone cabin that boasts a secluded and romantic setting for honeymooners or special celebrations. The cabin features a king-sized bed, a private bathroom with walk-in shower and whirlpool bath, and a spacious seating area with plush leather chairs surrounding a wood-burning stove. The Kingfisher Restaurant & Wine Bar serves a creative menu of seasonal and local cuisine, prepared fresh with ingredients from the hotel’s very own organic garden. Open for breakfast and dinner daily, The Kingfisher presents gourmet cuisine in a relaxed and elegant setting with spectacular views of the surrounding landscapes. The cuisine is accompanied fine wines from around the world by the glass or bottle, craft beers, and signature cocktails. The Grotto is a casual, inviting bar that serves an extensive selection of wine, beer, and spirits in a laid-back atmosphere. Interiors are decorated with faux granite walls featuring petroglyphs and carvings of wildlife, while a dramatic Chihuly Icicle chandelier takes center stage. A new outdoor space boasts a fire pit, waterfall and plenty of seating for cozy bonfire nights beneath the stars. O'Grady's Pantry & Mercantile is an ideal spot to enjoy casual alfresco dining in a comfortable, family-friendly environment. The restaurant has an expansive, granite patio on which guests can enjoy outdoor dining for breakfast, lunch, and dinner with menus featuring a delicious blend of Pacific Northwest favorites, local specialties and house-smoked meats. The casual café also serves a selection of coffee and espressos, organic teas, juices and sodas along with Northwest wines, beers, and spirits. The Sleeping Lady Mountain Hotel offers a home-away-from-home ambiance with an array of modern amenities and indoor and outdoor activities to enjoy all year round. The Aspen Leaf Spa is an exclusive mountain spa that offers a range of relaxing massages, rejuvenating body treatments, and cleansing facials, as well as other salon services in serene treatment rooms. A family hospitality room known as The Play Barn features billiards’ and table tennis tables, a small stage for skits and shows and an assortment of board games and puzzles, while a 24-hour fitness room with state-of-the-art equipment is ideal for keeping fit. A well-stocked library offers a tranquil place to relax with a book, and a small gift shop sells mementos, apparel, gifts and other items. Additional guest amenities at the Sleeping Lady Mountain Hotel include complimentary beverage services including iced tea, coffee, and organic hot teas served throughout the day and a dry sauna in which guest can relax and unwind. Activities in and around the resort range from swimming in refreshing, natural rock-lined swimming pools, which are open seasonally or a year-round heated indoor swimming pool to mountain biking, hiking or cross-country skiing. Cross-country skis, snowshoes, and mountain bikes and can be rented from the hotel and enjoyed on the many groomed trails and skate lanes around the hotel. Stroll through the beautifully manicured organic garden, which produces herbs, vegetables, and fruit used in the hotel restaurant or take a self-guided art walk and savor the relaxing combination of nature and art. For more adventurous and sporty types, there is volleyball, badminton and horseshoes to play with equipment available to rent and a complimentary intra-resort shuttle service are available to transport guests and their luggage to and from their rooms. The Aspen Leaf Day Spa provides guests with a relaxing and memorable spa experience. Located in a tranquil location within the Sleeping Lady Mountain Resort, the Spa offers a range of holistic services inspired by nature, including massages and massage therapies, facial enhancements and skin care, salon services such as manicures and pedicures and more. Additional spa services include complimentary robes and slippers, organic tea and chocolate, meditation and walks in the organic garden, self-guide art walks, steam showers, dry saunas, yoga sessions and Signature Jade Treatments. 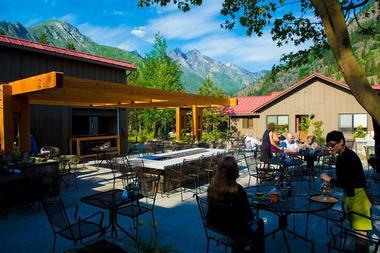 Sleeping Lady Mountain Resort offers an unrivaled setting for weddings, anniversaries and other special celebrations. The resort boasts a variety of exquisite indoor and outdoor settings ranging from the grassy banks of the Icicle Creek to elegant indoor spaces that reflect the essence of the Northwest. In addition to beautiful venues, the hotel and resort also offer a range of special services such as catering, planning and event management and more. Back to: Romantic Weekend Getaways in Washington State, Things to Do in Leavenworth and 25 Best Places to Visit in Washington State.